Thailand is one of the most dazzling holidaying destinations in South East Asia. The kingdom is endowed with breathtaking natural beauty, inspiring temples, romantic beaches, which will sum up with a blend of leisure and entertainment in the vacation. An Ideal opportunity to explore the Bangkok & Phuket also enjoy the fiesta with grandeur. We Journeyfix Travels offer you the best Bangkok and Phuket Tour Packages and Bangkok and Phuket Holiday Packages at the best available prices. After Breakfast, Check-Out from Hotel (Around 12:00Noon) then you are free till Pick-Up Time to take an Next OR Return Flight to India . Dream World Theme Park- is on the outskirts of Bangkok, situated on Rang sit - Ong-kharak Road near the Don Mueang Airport. It is a classic European-style fantasyland, theme park with miniature versions of legendary sites and a huge variety of modern amusements is ideal for the family. The Park is full of all the characters from Hollywood, so children love it, especially Thai kids who adore all the American Disney cartoon characters. There’s a parade every day called Colures of the World, but there’s a lot more going on. Dream World has a Fantasy Land and an Adventure Land. There are animal shows, adventure rides, water activities, replicas of the Seven Wonders of the World – just about everything for a fun family day out. Dream World theme park is open Monday to Friday from 10.00 a.m. to 5.00 p.m. and Saturday to Sunday from 10.00 a.m. to 7.00 p.m.
Safari World Zoo & Marine Park: Take the family on a full-day guided excursion out of Bangkok to Safari World, Thailands greatest and most popular open zoo. Covering over 200 acres, Safari World comprises of two main attractions - Safari Park and Marine Park. Two storey underneath the glitzy Siam Paragon shopping mall, an aquatic wonderland the size of three Olympic swimming pools awaits your discovery at the Siam Ocean World. This underground aquarium, one of the largest in Southeast Asia, will dazzle you with innovative world-class exhibits and over 30,000 curious looking creatures from various depths and aquatic regions across the globe. Meet some of the world’s record holders, transported all the way from the Amazon River or the Jurassic period when dinosaurs still roamed the earth. Greet the ocean’s deadliest predators in the 270-degree underwater tunnel, sneak a peek into the open ocean from a glass-bottom boat, or, if you really can’t resist, dive in and have a swim amongst the sharks and rays. For kids, a few hours spent at the Siam Ocean World will be as educational as it is exhilarating and memorable. Your journey into the Big Blue begins with a prelude at the ‘Weird and Wonderful’ zone, which houses an impressive collection of rare and bizarre-looking marine creatures, such as striped frogfish, garden eel, nautiluses and gigantic spider crabs. The Deep Reef features some of the most fascinating reef dwellers in the world; among them, bat fish, humped head Maori Wrasse and Blue Tang. Learn how sea animals survive in the Living Ocean, and take a hike in the Rain Forest where ancient African lungfish, blind cave fish, giant water rats and otters are on display. Observe life on the edge in the Rocky Shore zone, where penguins and other marine mammals learn to survive under constant change in the unpredictable environment. Stop to feel the skin of friendly starfish in a petting pond, before continuing on to the 270-degree underwater tunnel and the Open Ocean, Asias largest panoramic oceanarium showcasing sharks of various types – ragged-tooth, black-tipped, leopard – stingrays and giant groupers. Just before you leave, drop by the ‘Sea Jellies’ zone and take in the theatrical display of light and musical symphony as the translucent invertebrates float about in the LED-lit tanks. If you expect more from your visit to an aquarium, Siam Ocean World won’t disappoint you. Your choice ranges from observing the marine creatures from a glass-bottom boat and touring the ‘back of the house’ to combing the ocean floor in a diving suit and 180-degree helmet as well as diving with the predators and their prey in the Open Ocean. Children will love the exciting around-the-clock shows, including Shark Feeding, Rocky Shore Talk, Penguin Feeding, Diver Underwater Talk, Rainforest Zone Feeding, Animal Contact and Otter Feeding. You can even feed freshwater fish, among them the Chaos Phraya River Stingray and Mekong Giant Catfish – from the Feeding Pier in the Rainforest or have the little fish ‘massage’ your feet at the Happy Fish, Happy Feet Pool. Please note that extra charges apply for each additional activity. The fun doesnt stop only in the deep blue sea. Come up for a breath of fresh air and a 25-minute virtual reality adventure with the Sanyo 4D-Xventure (charges apply). Using state-of-the-art technology, the virtual environment created by the theatre and its ‘4D Invader’ seats promises to squeeze a scream or a giggle out of every viewer during the movie – that extra thrill that makes 3D theatres so yesterdays news. So, hold on to your seats and enjoy the dive into the virtual underwater world! BTS: Siam / How to get there: Take Exit 5 from the BTS Siam Station, which provides direct access to Siam Paragon. Phi Phi Island- is known by its uniqueness, beauty, the most famous tourist destination. With only 45-60 minutes by Day Trip Speedboat travel from Phuket, Phi Phi Island offers a great laid back tropical tour, trip and lifestyle. Phi Phi Leh is well-known destination for its excursions for cavernous scenery, stunning cliffs, and mesmerizing water. Here, there are several beautiful tourist spots, such as Lo Samah, Hin Klang, and Viking Cave which you can enjoy by speedboat. The effect of their steep coast limestone cliffs, classic white sandy beaches, emerald water, colorful pattern of coral reefs and seafans, large caves and bonsai trees appeal million of visitors each year. Enjoy tour in Maya Bay (location for Hollywood film "The Beach"), Loh Sameh, Pi Leh Cave, Snorkeling, Swimming, Crystal water, and Spectacular scenery by speed boat. It is impressive double bay surrounded by white sandy beaches and sunlit crystal water. This is where all of the entertainment venues are located for your perfect trip on travel vacation. Enjoy all kind of musical taste and cuisine is great here. We are confident you will have your unforgettable travel day trip on this program as one of our best selling tour in Phuket. Additional 200 Baht charged for roundtrips transfer in Cape Panwa, Rawai, Naiharn, and Rayan. JW Marriott, Nai Yang, NaiThorn, MaiKhao = 300 THB per person. James Bond Island:-Experience something difference from white beaches and clear crystal water. We have a comprehensive travel trips to fulfill your holiday by real impressive scenery of Phang Nga Bay and James Bond Island - Thailand Tour. The bay has become one of the most beautiful National Park of Thailand. With limestone and caves, Our Day Trip boat will take you to see and sightseeing the mystical view around the bay and fishing village. Visit James Bond Island and Koh Ping Gun tour, the rock formation about 20 meters tall and "Hills Resting on Each Other Island". You will sail through Tham Lod to explore its beauty before visiting fishermen Village of Koh Panyi. Thailand is a constitutionally monarchy & it is the only country in south-east Asia to have escaped colonial rule. Thailand Cities, Islands are popular & famous Holiday Destination as these are legendary the world over, such as Bangkok, Phuket, Pattaya & Koh-Samui. Thailand is an Excellent Destination for Eco Tourism because they are mainly based on Tourism Industry.Sacred Monkey Forest Sanctuary is quiet and beautiful providing a lush and calm atmosphere to approximately 200 long tailed Balinese Macaques. The path has seeping thick green flora and leads up to 3 holy temples in the compound. You can also visit the Klungkung Royal Palace, which is a reflection of old Bali heritage and culture. Bangkok Structure & Construction is also having a well Name in Asia Being Lots of Hotels & Shopping Malls & Suvarnabhumi International Airport is Most Advance Example for Thai Culture & There Modernization Values. . If you look Bangkok City in Night from Sky then you will found a Small wonder of Little Stars as Life never sleeps in this fantastic City of Asia. 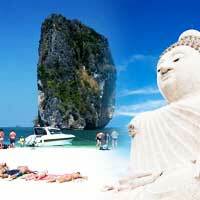 We are making Holiday Tour packages to Thailand with Mixed Combinations Like?